SAN FRANCISCO - Yahoo Inc. Chairman Terry Semel stepped down as chief executive in a surprise move Monday, ending his increasingly ineffectual pursuit of online search leader Google Inc. ¡ª a losing battle that had demoralized Yahoo's shareholders and employees. The Sunnyvale-based company appointed co-founder Jerry Yang as its new CEO and named Susan Decker as its president. Decker, who had been touted as Semel's heir apparent, was recently promoted from Yahoo's chief financial officer to oversee the company's advertising operations. Semel, 64, will remain chairman in a non-executive role after spending the past six years running the company. "I saw myself as more of a coach than a player going forward," Semel told analysts and media during a Monday conference call. Signaling Semel's decision was voluntary, Yahoo said he will not receive a severance package. The former movie studio executive already has made a fortune since joining Yahoo in May 2001, having realized nearly $450 million in gains by exercising some of the stock options that he received during his tenure. Despite Yahoo's recent struggles, Semel received another big bundle of stock options last year that boosted the value of his 2006 compensation package to $71.7 million. That was more than any other CEO among 386 publicly held companies covered in an Associated Press analysis of executive compensation using new rules dictated by the Securities and Exchange Commission. In Monday's conference call, an emotional Yang hailed Semel as "a role model and mentor" and then sought to defuse recent speculation that Yahoo might be sold to Microsoft Corp. or another suitor hoping to exploit the recent turmoil at the company. "I am totally excited and energized about assuming the leadership of this great company," Yang said. "We have a long and prosperous future if we execute correctly." Yang, 38, still owns a 4 percent stake in the company. Fellow co-founder David Filo, who is helping to run Yahoo's technology group after the sudden retirement of the department's leader earlier this month, owns a 6 percent stake. Monday's shake-up unfolded less than a week after Semel faced off with shareholders disillusioned with a nearly 30 percent drop in Yahoo's stock price during the past 18 months as its financial growth fell further behind Google's torrid pace. Mountain View-based Google now makes more money in a single quarter than Yahoo does in an entire year. The contrast represents a startling comedown for Yahoo, which was the larger of the two companies when Google went public in August 2004. Since then, Google has steadily expanded upon the Internet's largest advertising network to create nearly $140 billion in shareholder wealth as its stock price increased by more than six-fold. Yahoo's stock, meanwhile, is worth a little bit less than when Google went public. Google's meteoric rise also has decimated the employee morale at Yahoo, leading to a recent wave of executive departures that raised concerns about whether the company would be able to retain the talent it needs to regain its stride. Just last week, Semel assured shareholders attending Yahoo's annual meeting that he had the fortitude to lead a comeback. He has been counting on recent improvements to Yahoo's online advertising system and a series of key partnerships to boost profits after the company suffered an 11 percent drop in its first-quarter earnings. In Monday's conference call, Decker said the advertising upgrade, known as Panama, is delivering results that so far have exceeded management's expectations. 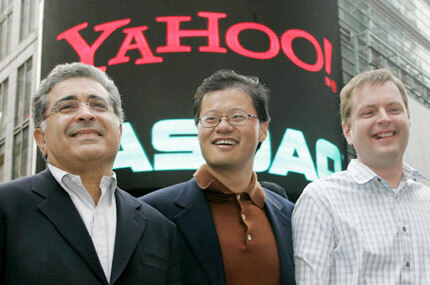 Yahoo shares gained 81 cents finish at $28.12 Monday, then surged $1.14, or 4.1 percent, in the extended session.